The large blousy blooms of the Peony make wonderful cut flowers and if picked in bud can last for three or more weeks in a vase. Peonies are native to Europe, Asia and western north America but cope well with the British climate. Flowering around May and June, the small round buds unfurl to disclose delicate, extravagant blooms ranging from white, through cream and lemon and from palest pink to the deepest burgundy. Strong stems provide good support in the vase and the flamboyant blooms are great for single display or mixing in a bouquet. Most Peonies are herbaceous perennials, reaching about 1.5 metres tall. These totally die back to the ground in winter and regrow in the spring. Tree Peonies which originated in Asia form a deciduous tree, around 3 metres tall, with some having a delicious fragrance. 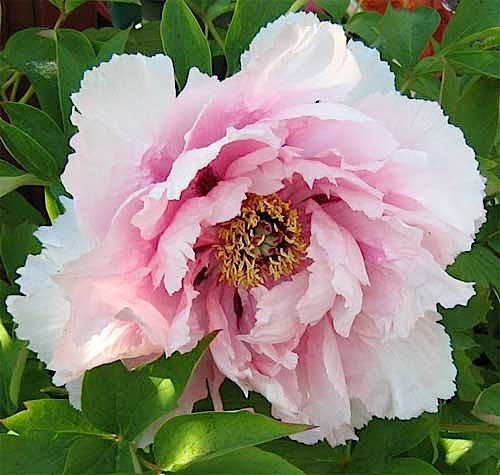 Intersectional or Itoh Peonies are a recent development combining the features of the herbaceous and tree varieties. Peonies prefer well drained soil and sunlight. The tuberous root should only be planted about 5cm below the soil surface. Wet or windy weather can be a problem, so most peonies require staking to keep the plant looking tidy. Peony Wilt can affect the plant during wet weather but as the plant dies down over the winter months, the new growth in the spring is often unaffected. The strong dark leaves of the peony plant provide form and structure in the herbaceous border and they look effective planted alongside Roses, Aquilegia, Nepeta and Penstemon. Rosie Hardy form Hardy’s cottage garden plants explained to the BBC how to grow Peonies and other garden flowers for a bouquet and Top Mayfair florist Yan Skates won a gold medal for his arrangements featuring British grown garden flowers. Claire Austin Hardy Plants – Specialise in Herbaceous, tree and intersectional Peonies. Peony Flowers – More information on peonies as cut flowers, how to cut and condition for extended vase life. The Peony Society – A focus for Peony enthusiasts all over the world. How to grow Peonies – In depth information on how to get the best from your herbaceous, tree and intersectional Peonies from Claire Austin.